In today’s digital world, website performance and speedy load times are critical. This is now common knowledge. However, until recently, it’s been tough to quantify the extent to which speed and performance actually affect day-to-day operations. The problem is that site performance has generally been viewed as a technical metric and not a business metric. So, earlier this year, Sunnyvale-based website optimization startup Torbit launched new product called Insight that aimed to solve this problem by giving businesses a way to measure their website’s performance and find out just how much speed is impacting their critical business metrics. By allowing businesses to easily correlate how site performance is impacting their revenue while offering suggestions on how to improve (and where to start), Insight can provide a boost where they need it most: Their bottom line. It’s not surprising then, that since launching in April, Insight has found steady adoption from businesses — especially among eCommerce platforms. But rather than simply functioning as vanity metrics, this growth also brings with it some good news for the startup’s users, allowing Torbit to begin offering more of its services for free. Most of features in the startup’s Premium Plan, which is now offered for $500/month, will soon be offered as part of its free plan. The company plans to continue offering Enterprise Plans for larger businesses, but the startup wants to reduce the barriers to entry in the hopes of reaching a broader audience. Again, beyond the marketing-friendly stats, Torbit’s growth has produced some data that is worth sharing because it contains some broad implications for anyone building a web-based business. Over the last few years, the Web has changed dramatically. As websites become rife with rich media and look and feel more and more like applications, there’s more stress being put on browsers, which now do most of the parsing, rendering and code execution. Thus, performance has moved from being a server-side issue to a front-end, client-side problem. And Torbit now has the data to back this up, as Fraser says that Insight has shown that 93 percent of performance issues and bottlenecks now occur on the front-end. Torbit’s data also offers a look into performance by geography, including which states and countries have the fastest load times, as well as browsers. 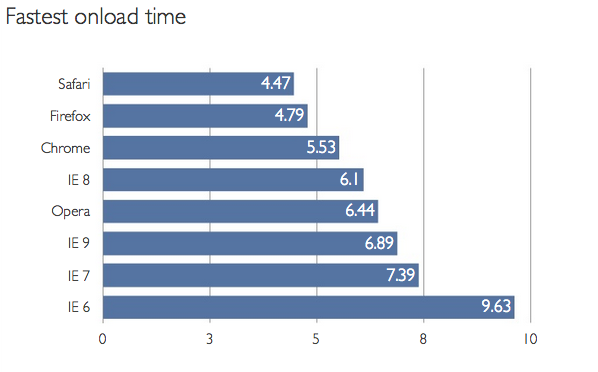 According to Torbit’s data, Safari clocks in as the fastest, followed by Firefox, Chrome and IE8. The fastest mobile browser? Opera Mini, with Chrome for iOS coming in second. Hilariously, the only mobile web pages that load in one second or less are error pages. In short, at this point, the mobile web does not = speed. 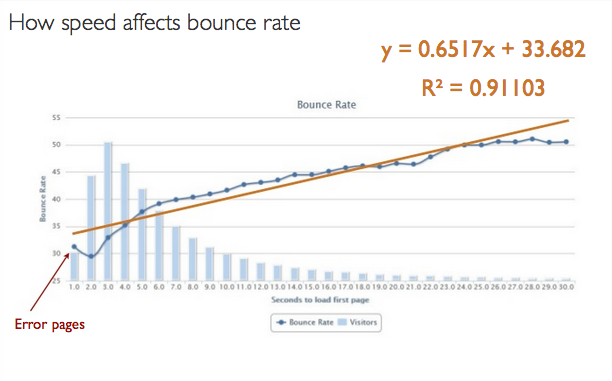 In terms of the aforementioned correlation between load times and lost (or gained) revenue: Torbit found that for every second of load time, there is a 0.65 percent increase in bounce rate. Companies can reduce their bounce rate by 10 percent (and double user engagement) simply by cutting average load times from six seconds to two seconds. But perhaps the most eye-opening piece of data is that the average load time for websites (across the Web) is seven seconds. Go ahead and count that out. The 90th percentile? 18.5 seconds. Yep, that means 10 percent of sites on the Web take more than 18 seconds to load, which in turn seems to indicate that 10 percent of websites don’t have any visitors — aside from those on LSD.